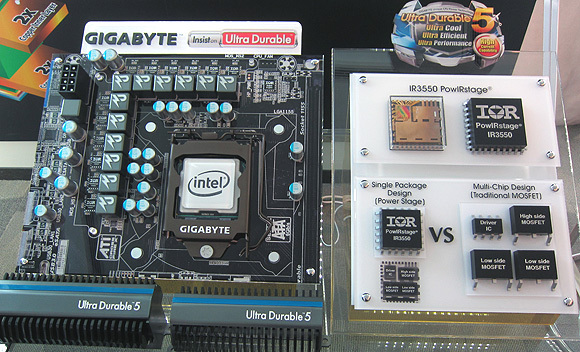 Gigabyte unveiled several new Intel X79, Intel B75/H75 and AMD A85 based motherboards at Computex 2012 Taipei, this year. These motherboards support Intel socket LGA2011, LGA1155 and AMD socket FM2 processors. It's always fun to learn what new technologies are in store for us, so today we're going to take a quick peek at Intel's Thunderbolt, AMD's upcoming socket FM2 & AMD A85 chipset and reveal a few tasty tech tid bits you won't want to miss! 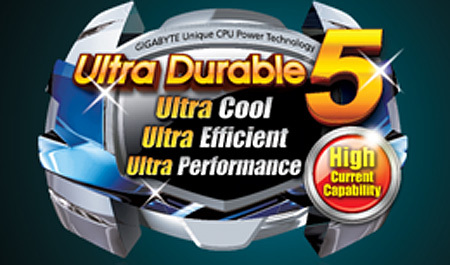 It was at Computex 2012 that Gigabyte decided to roll out the fifth generation 'Ultra Durable Technology'. Let's consider UDT for a moment as it's particularly relevant if you use CPU watercooling or plan on building a silent computer system. To begin with, 'Ultra Durable Technology' is essentially a catch-all name given to a small group of electrical components used in the manufacture of Gigabyte's boards. Ever since the devastating 'burst capacitor issue' reared it's head and took down ABIT, Tier 1 motherboard makers have been extremely conscientious about the quality of board level components. In fact, it was in the aftermath of the burst capacitor storm that Ultra Durable was born and Gigabyte switched from electrolytic capacitors (of the type that failed like popped corn) to solid state polymer aluminum capacitors across the board. Pun intended. Every year or so afterwards, Gigabyte has tacked on a number and rolled out a refreshed version of its Ultra Durable Technology with a significant improvement, a power saving feature here and there, or a modest change. The Ultra Durable 5 system adds IR3550 PowIRstage single package design motherboard VRM and high capacity ferrite core chokes rated to 60A into the mix. New to UDT5 is an interesting IC recently developed by International Rectifier that does away with several discrete MOSFETs in the motherboard VRM circuit, integrating those different power stages into one beefy compact component. 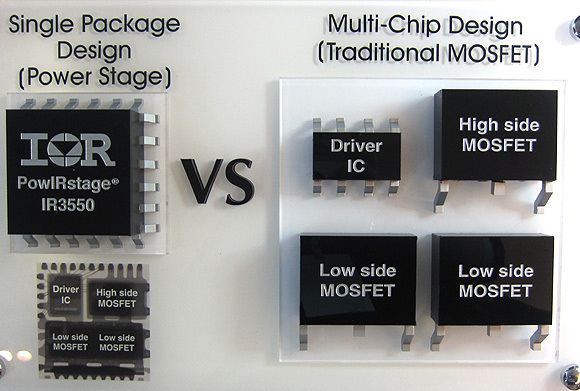 According to International Rectifier, the IR3550 PowIRstage "DirectFET" IC provides more power efficient (95%) power delivery to the CPU in a compact footprint and is more capable of high current loads (up to 60A apparently) than previous circuit designs. In the above photo you can see a larger than life mock up of the IR3550 and the three discreet MOSFETs plus one IC it replaces. 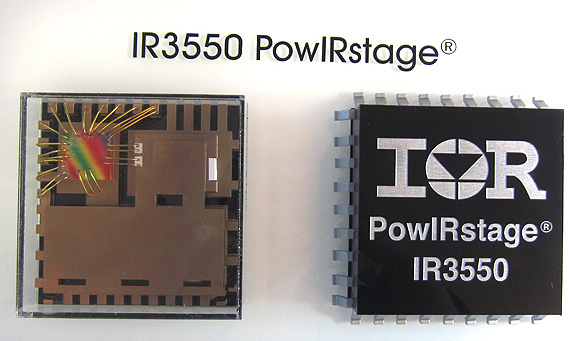 The IR3550 PowIRstage single package design. X-Ray photo and Power Stage decapsulation image shown below. IR3550 PowIRstage ICs are able to maintain a lower power losses, which means less heat as a byproduct of heavy current loads. 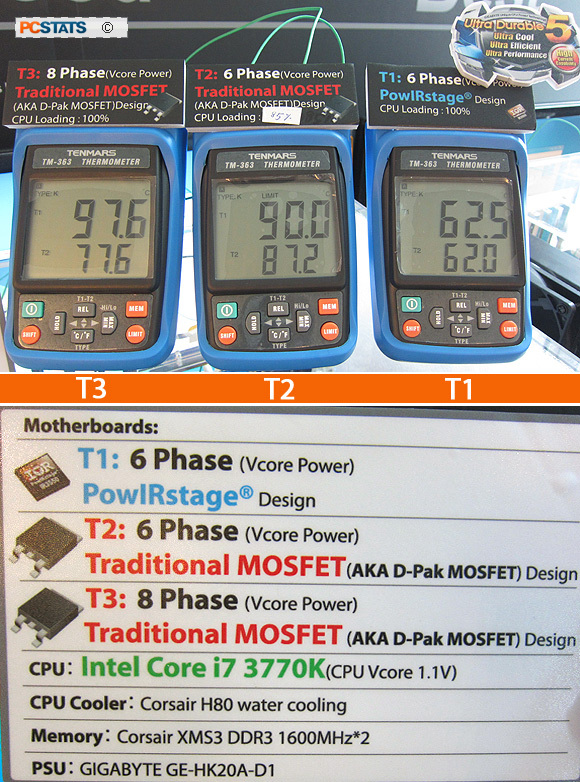 The single package design of the IR3550 PowIRstage replaces several Lower RDS MOSFETs and in Gigabyte's demonstration at Computex, this was illustrated by a VRM temperature drop of 30C over more traditional power circuit designs. UDT5 also incorporates previous design elements such as 2X Copper PCB, high current Ferrite Core Chokes, solid state aluminum capacitors and all digital PWM controllers. The new Gigabyte Ultra Durable Technology 5 Motherboards will include the following models: GA-X79S-UP5 WIFI, GA-X79S-UP5, GA-X79-UP4, GA-Z77X-UP7, GA-Z77X-UP5 TH, GA-Z77X-UP4 TH and Gigabyte GA-F2A85X-UP4 motherboard. More from Gigabyte's suite at Computex 2012 is coming up right after the jump.